Now ten states have active legislation pending regarding Daylight Saving Time, with four additional states where legislation has been killed in committee or dropped. 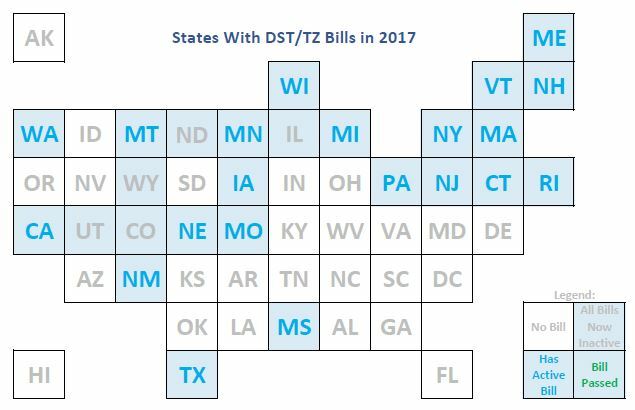 See the “Status By State – 2015” menu for the list of states, and click on a state to see up-to-date information about that state’s legislation. Fifteen states had legislation from 2010 to 2014… all of which failed. See the “Bills in 2010-2014” under the “More Info” menu for information about those states. Some states are looking at ways to go to year-round DST, and while the current US time zone regulations do not allow for this option, we believe there are ways to accomplish this within the scope of current law. See our thoughts here. Please follow us on Twitter @TimeZoneReport and like us on our Facebook page! Too busy to be social? it’s okay, you can listen to the Time Zone Report podcasts! We provide up to date information from a wide variety of sources to support your efforts. We provide information to help you decide if this is a good move for your state, along with contact information for the bill sponsors and your other legislative representation. We are working with various technical organizations to ensure that your transition to a “DST-Free Time Zone” is as smooth as possible. We have completed the transition from the “Stop Daylight Saving Time” web site to the “Time Zone Report” URL, to provide a more balanced view of US time zone legislation. 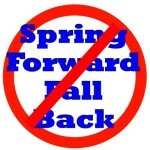 We still support states that are considering legislation to abandon Daylight Saving Time transitions. Research from well-respected organizations overwhelmingly shows that DST transitions kill people!